I'll nominate Freddy's Pizza in Cicero. 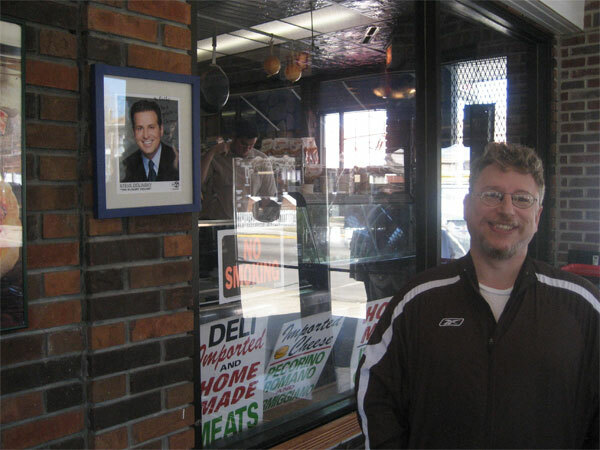 Freddy's might look like nothing more than a take-out deli, but it is really a repository of the efforts of its owners, Joe (and his wife). Every day, Freddy's is filled with a full production from the kitchen. 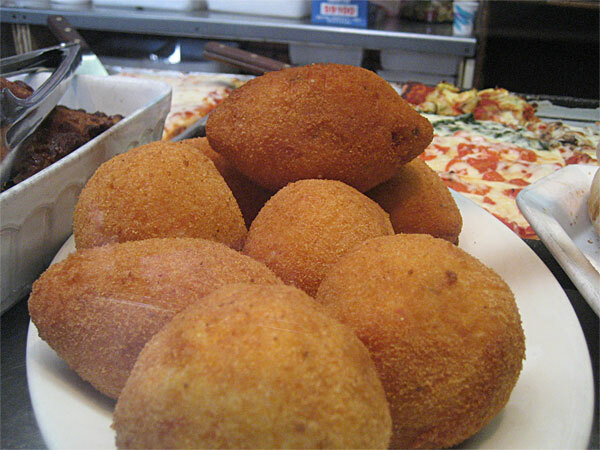 There will be a roasted chicken with potatoes (some call it Vesuvio), sheet pizza AND pan pizza, (as well as other ancient pizza like concoctions like strombolli), rice balls (arancini) and similar fried items; two or so pastas, always pounded, breaded pork and chick cutlets (we called them panneed when I lived in New Orleans); typically something green, most often rapini, an assortment of salads of fish and olives and meats. Always there but not always visible are mixed meat subs, Italian beef sammy's with a rather unique tomatoey gravy, and meatball subs. Lunch is always a chore to decide. For dessert, there is both excellent ices and excellent gelato, again both made with effort and care. Yet, for all the pleasures of indecision that lunch brings at Freddy's, the real pleasure may lay in what else there is to offer. Joe and Anna Marie must not rest easy. 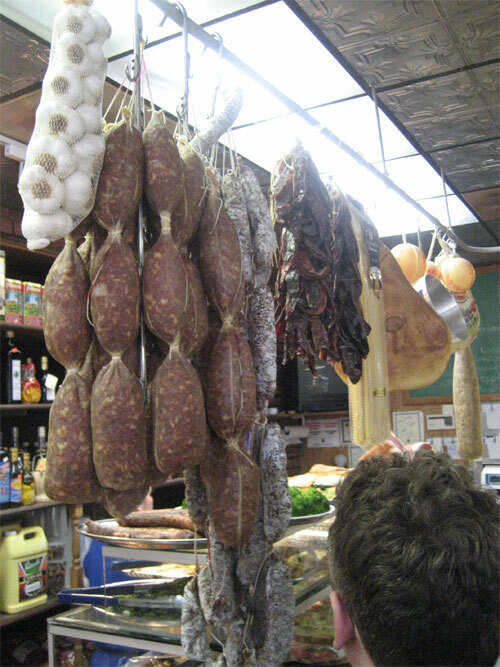 Besides the prepared food described above, they build dried and fresh sausages in several forms, they make their own hams and they bake several breads each day. The breads alone would make Freddy's one of the most special shops in Chicago. Freddy's is a REAL throwback. It is in a residential neighborhood, the neighborhood mostly changing. It's long time neighbor, the equally great Jim's Meats now sadly gone. Yet, people still flock because of what they can get only at Freddy's. It's interesting, see the several of the mentions of Freddy's on this board. The place is just so there that it really has no full review. Rather, it is often cited for its various items when those threads come up, meatballs, home made sausages (both fresh and dried), bread, gelato, but there is really no post extolling the virtures of Freddy's en total. I hope this remedies that fact. See below for some of the mentions. My wife and I love this place. Their meatball sub is the best that I have ever had and the rice ball stuffed with either meat and peas or cheese and spinach are to die for. One of our favorite things is the hot from the oven pepperoni bread. Just geta little red sauice for dipping and you will be in heaven. We have two little ones, so we always try to get there early on Saturday right when they open to beat the crowd and get the fresh breads. I have somewhat mixed emotions about Freddy's, but what I like about the place (the calzone, the bread) outweighs my uncertainties (somewhat bland sides that look a lot more interesting than they taste, sometimes pushy counter people). I felt a little remorse when Freddy's glassed in their funky little side eating area, but there's no doubt that this makes it more of an all-weather place to go eat. As VI mentioned, the joint is a throwback, and I enjoy it for its truly neighborhood feel. I believe zim mentioned here or on another board that Freddy's gets some tasty descriptive passages in Alex Kotlowitz' recent Never a City So Real, which is worth reading for other reasons as well. Coincidentally, Amata and I went to Freddy's for the first time yesterday morning. With regard to the cooked items one might have there, we only tried one (which we got 'to-go'), namely a stuffed chicken breast (the stuffing turned out to be ricotta) with sautéed red and green bell pepper strips and mushrooms: It was quite tasty. Of the other cooked items I saw on display, several looked great, including a risotto made with very small rings of calamari, roasted chicken, a couple of different veal preparations. There were also a couple forms of pasta on display, including gnocchi served in a tomato sauce. All in all, the way everything there looked reminded me very much of a tavola calda one might see in a bustling peripheral neighbourhood in Naples or Rome. Beyond that, some of the items we bought as groceries could have been ordered for consumption on the spot and I thought they were very good. We bought a pepperoni roll (quite tasty as a snack), a long loaf of Italian bread (with a nicely browned and, in spots, blackened crust), and some very delicious sesame rolls. Those rolls we used at home to make sandwiches from their fresh mozzarella (very fresh and still tangy, as tangy as fior di latte can get around here) and two of their 'home-made' pork products. These were: 1) the mild sopressata, which was excellent, and 2) their prosciutto, which I found surprisingly good. Not so relevant for this thread but worth briefly noting is the fact that as an Italian grocery they carry some excellent products at reasonable prices, including two of my favourite brands of pasta, Giuseppe Cocco and Voiello. ... And the gelato definitely looked worth a try as well. * A pox on those who mindlessly reduce this expression to the now current but utterly meaningless version: "the proof is in the pudding." Feh. I love Freddy's and have since the first time VI introduced me to it at the tail end of the first Beefathon. My favorites are their sausages, bread and gelato. The wide range of prepared dishes and antipasti are always fun, too, even if I find some are better than others. Plus good stuff to choose from on the well-stocked shelves, and a great environment. I cannot get out of Freddy's for less than $40, I find. So many selections, in fact, that I have yet to try the pizza, and have only tried their beef sandwich that once, at the end of a long day of beef sandwiches. Did I mention that I really like their bread and sausage? I always find Freddy's worth a detour. 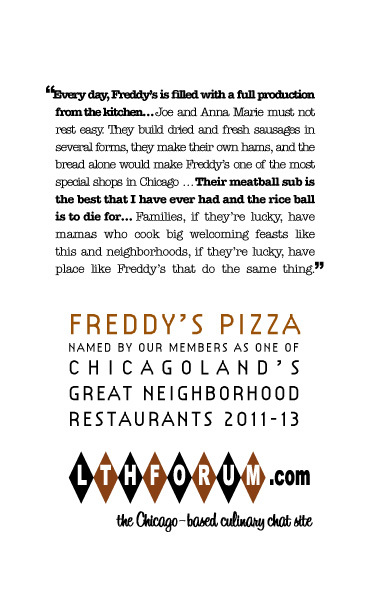 Freddy's is widely admired among the south Oak Park families of my acquaintance. I know two excellent lasagna-makers who quit making their own after they discovered they could buy a tray from Freddie's instead. I also want to hold their fried artichokes and their seafood salad up to the light. And their homemade ravioli, purchased from the freezer case. What we love most of all, though, is Freddy's pepperoni bread. I remember a Bruce Craig (I think) article in the local paper some years back saying that they starting making their own bread when they couldn't find any they liked well enough to sell. For the peppperoni bread they take their good Italian bread dough and spiral it full of just the right amount of good pepperoni. They often sell out by 11 or so, but if you can't make it by then give them a call and they'll save one for you. In fact you'd better order at least a couple of loaves, because one of the loaves will be pretty badly damaged by the time you make it home--though your car will smell wonderful. Just be prepared with lots of cash. They do not accept credit cards OR checks. As noted above, even at their very moderate prices you will keep finding things to buy and your total is sure to be more than you anticipated when you told yourself you were just going to run in for a slice and a gelato. Meatball lasagna, outstanding. Try a warmed pork tenderloin "sangwitch" on fresh house baked roll with red gravy and giardinare, three fried artichokes and a Fresca. Do this from the front seat of your car with the juices from the lunch dripping down your arm. Also buy some peperoni bread for later. The Ms. and I headed out for our first visit to Freddy's yesterday so she could have some gelato and I could have some bread and sausage (thanks dickson). We split a huge hot sausage sandwich w/marinara and giardiniera. I really enjoyed the flavorful sausage on the chewy bread. The giardiniera could've had some more bite for my taste, but it had a nice array of veggies, including olives, which I enjoyed. A couple containers of salads that rounded out our meal, caprese salad and seafood salad (mostly octopus), were a nice balance to the sausage, but a tad flavorless. At the end of our meal, we couldn't avoid two flavors of gelato: tiramisu and dolce di latte. The Ms. loved it, but then again, she's never met a gelato she didn't like. (Except for possibly the stuff served at Cyd & D'Panno). Overall, while I'm not rushing back to Freddy's for the food, there's so much to like about this place. Their array of offerings, convivial neighborhood atmosphere, cheery staff, clear dedication to their food, enthusiastic clientele, and fantastic visual appeal, make this place an easy GNR pick for me. eatchicago wrote: Overall, while I'm not rushing back to Freddy's for the food, there's so much to like about this place. Their array of offerings, convivial neighborhood atmosphere, cheery staff, clear dedication to their food, enthusiastic clientele, and fantastic visual appeal, make this place an easy GNR pick for me. That was exactly my response the first time I went to eat at Freddy's. There is so much to like about the place, and I like the food okay, but I like the vibe much more. I've only been there once or twice since they added the enclosed eating area (which kind of detracted from the old school, eat-on-the-street scene of the previous setup), but it's still a fine littel place, and I have the feeling it might be around for a while (unlike it's neighbor, Jim's, RIP). Then just for the sake of argument, I guess I'd better disagree. Seriously, though, I understand what you mean, and I guess I just see a big gap between my expectations for a place like this and the goods (foods) delivered. 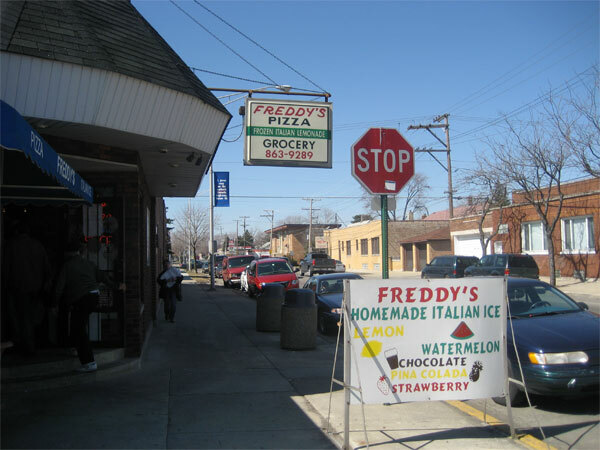 Taken side-by-side with many other little "Italian" joints, Freddy's is probably much higher to the top of the list of good places than my post might have suggested. FWIW, David, I tend to agree with you across the board. Not everything at Freddy's is as wonderful as it could be, but certain items - sausage, bread and gelato leap to my mind - are just plain wonderful. And some of the antipasti and prepared meals are quite good. Others do leave me lukewarm, but that can be the style, the preparation, or the fact that some things do not work as well when cooked ahead, held and reheated. No place is great in all its offerings, and Freddy's offers a lot. Between the items I know to be great, and the breadth of offerings, none of which I have ever found to be bad, I love the place, and stop by whenever I can. I like some things more than others, but I am pretty much always happy with what I get. A neighbor, unprompted, mentioned this morning that she'd served Freddy's veggie lasagna at a graduation party last night. Said it was better than anything she could make, better than any she's ever had anywhere else. Another speciality on the "to try" list. dicksond wrote: Not everything at Freddy's is as wonderful as it could be, but certain items - sausage, bread and gelato leap to my mind - are just plain wonderful. And some of the antipasti and prepared meals are quite good. No place is great in all its offerings, and Freddy's offers a lot. Between the items I know to be great, and the breadth of offerings, none of which I have ever found to be bad, I love the place, and stop by whenever I can. To paraphrase, Nelson Algren, it's like falling in love with a girl with a broken nose. You may find restaurants with tastier food, but rarely one so real. Considering I tried to nominate Freddy's myself a few days ago, before Gary gently removed my post and let me know VI had already nominated it, I'd say I'm a fan. All I wish is that it were open after 7 (that means there are only two days I can go, friday and saturday) and a bit closer to Pilsen. But neither of those is going to happen, so I'll just have to make regular friday morning treks to Cicero. I strongly encourage Freddy's for renewal. I was lucky enough to work close enough to stop by several times a week last year. The first time I was a bit put out by the ordering system -- no number sytem or line -- but the food always made up for it. The only disappointment I would have is when they were out of a wanted dish, but I always found something else that I was pleased with. Freddy's is really the definition of a neighborhood restaurtant and one worthy of a continued GNR. I'll agree that Freddy's has not slipped in anyway, but instead maintains all the good stuff that made then a GNR the first time around. Same people turning out the same great food. Still at the top of their game. Freddy's is a place that just doesn't do it for me. Other then their bread, there's not much there that I like at all. I recently paid them a visit on my way to Xni-Pec and my feelings were confirmed. Most of the prepared food seems warmed over and somewhat bland. They only make a couple of the sausages (salumi) in house and the rest can be gotten elsewhere. I guess if I lived in the neighborhood I would visit more often but for me it's not worth making a special trip. I also don't think it's out of the ordinary enough to warrant a GNR, but I'm sure not everyone agrees with me. I guess I understand your position Steve, since there are things at Freddy's that I find bland, and even overcooked at times (I tend to avoid their chicken dishes for instance). But they have wonderful bread (really, really wonderful bread - the best in Chicago for my money, deep dark, almost burnt, crisp crust and yeasty, airy, chewy inside, it is perfection), marvelous sausages, excellent gelati, darned good arancini, and usually one or two nice salads. Their baked pastas are usually pretty good and their pizzas are usually even better. Plus I admit to liking the people and the whole feel of the place. So, while I have had a few less than stellar things there, and I know some others who just plain dislike the place, the whole package is great for me. There is a place out by me that takes a similar approach with a wide selection of prepared Italian food, though they added a bar and tables to the front of it ending up with what looks like a completely different concept until you go in back and look at all the prepared dishes displayed, and they have some similar inconsistencies in the food. I tend to think that is the nature of the game, since they are preparing, holding and reheating. Not an excuse, but for what it is, Freddy's is great. Sure, some of the food is not as good as a sit down place with food prepared to order. But it is a wondeful takeout, deli and gelateria. I agree with you about the bread and the ambiance, but anyplace that leaves cooked food sitting out on the counter in the "food danger zone" all day long can't get my vote no matter how charming the place or the owners are. I'd rather go to a place like Riviera, for example, where the ambience is just as nice, the food is better and proper refrigeration is employed. Well, I definitely like Freddy's overall but more as an Italian deli and specialty shop and place with good gelato than as a source for cooked meals. I disagree that the bread is great -- to my mind it is good when very fresh but it doesn't keep well like the traditional style breads of D'Amato's and Masi's and perhaps also some of the west suburban bakers (I haven't bought bread from them of late and the memory is unclear), but while I like the fact that the bread is always crusty, I find the crumb somewhat underdeveloped in texture and flavour. On the other hand, they make some house-cured meats -- I've tried the soprassata and prosciutto and they're pretty good, esp. the former -- and they have an excellent selection of cheeses and other cured meats and fresh sausage, as well as packaged goods, all at decent prices. Concerning the cooked dishes, I have little to say; the couple of things I've tried were nice and most of the things I've seen set out there have looked well-prepared and all appeared very fresh but, given my particular background and my own cooking interests, I find very few places, including formal restaurants, serving prepared Italian foods here in Chicago of any particular interest to me. But I must say that I find the comment above implying that they might be risking food safety by leaving things out on the counter too long is rather out of line. Is there a record of any such problems? Do you know how long they leave things out? And how does a comparison with the "proper refrigeration" of Riviera make any sense when the subject at hand involves, in essence, a tavola calda? It doesn't. I still find the designation of "great neighbourhood restaurant" odd in application to places like Freddy's or Riviera but since the award is not granted strictly to restaurants, and Freddy's got one, I have seen no reason whatsoever not to renew it. On the contrary, one of Freddy's virtues, it's seems to me, is its consistency, its reliability, at a high level of quality. Last edited by Antonius on March 9th, 2007, 7:22 am, edited 1 time in total. When I first moved here, I thought there'd be a lot more places like Freddy's than there are. You have an impression that the Italian influence in Chicago is going to be wider spread than it is; certainly pizza is, and when I moved up here was probably the heyday of the trend of so-called "Northern Italian" restaurants (which I've defined as, "Northern Italian=any place that sprinkles fresh basil on the dish before it goes out"), but places like this I had an image in my head of, from Italy and from movies, yet they proved to be less common than I expected. And finally gelato and Italian ice to finish up. But more than these things-- which can be found elsewhere all around town, if not in such quantity as I expected-- Freddy's, like Manny's or White Palace Grill, has that great real Chicago place vibe, guys in suits and guys in hardhats and cops and even foodies all gathering and clamoring for hearty, easy-to-like Italian-American food. Freddy's was one of the last GNR places-- from any round-- which I had never been to, and so I PM'd Vital Information, who nominated it in the first round, to see if he'd serve as my guide, which he graciously agreed to do. We got a little of this and a little of that (including in my case a Filbert's root beer to wash it down) and enjoyed it all, not as in the best example of this or that we ever ate, but as in everything pretty good, hitting the spot, the sheer bounty of what all they produce day in and day out being the most impressive aspect of it. I'll happily go back for the food but, again, as with Manny's or White Palace, you could argue about this or that item as an exemplar of its type but you'd be missing the point. This is a great neighborhood restaurant, a quintessential Chicago place that defines the neighborhood around it and serves as its anchor. Families, if they're lucky, have mamas who cook big welcoming feasts like this and neighborhoods, if they're lucky, have places like Freddy's that do the same thing. Vital Information posing next to religious icon in "culturally appropriate track suit." Because I knew I had lunch planned w/MikeG, I resisted any earlier plunge into this thread, even after I had an especially nice meal there last week. I did not want to press, so to speak. And truth be told, while any time at Freddy's is a good time, some days are better than others. Yesterday was ample, but to a maven, a slow day (!). - about five types of pizza, including those baked in sheets and those baked in pans. - assorted salads including one with feta batons, another with garbanzo beans, and probably my fave (taken to go) slices of salami in oil. - three or so pastas, one with a "white" sauce of garlic and oil (too heavily dressed), two in red sauces; plus a vegetable rissoto. - a baked calzone-ish type of thing, one of the things Mike and I had, which included sausage and riccota. - two platters of bright green vegetables: rapini and brocoli. - logs of saw-sage, either plain or wrapped in dough. - 3 or 4 types of cold sammies. - a tray of chicken breasts "limone"
- hidden away, there's lasagna, italain beef, classic meat subs; I'm sure if one asked, Joe would/could whip up an aluminium tray of osso bucco. So...why list all of this stuff. Are we really a quantity over quality kinda board (well, yeah, but that's besides the point!). What makes Freddy's such a GNR is the daily output. Each day Joe and a couple of others just churn it out. That IS the point, Joe, churning, it, out. Everything tastes like someone's making it. Not Sysco, not a corporate test-driven recipe, not a team of sous-sous-sous-sous chefs*, but the hand of a few committed people. And who's perfect in the kitchen. Would you possibly toss canned peas into your polenta mold (MikeG thought that was an authentic touch, I'm not sure); would you over-sauce your pasta because you've learned that's what your customers want? (not the drama that makes a movie). I so admire and appreciate what they are doing. It surely is a place that deserves the support and praise of its GNR. *Although not positive, I'm pretty sure we saw Chef Cantu of Moto there yesterday. Beautiful posts, VI & Mike. What makes LTHForum great, too. And Freddy's meets one of dickson's rules of a good eatery in Chicago - any place that offers arancini every day is, like any place that offers fresh tortillas, great. Sure, there are places where it would take a lot more than that, but not in Chicago. I think if there was a place that offered a good green bean and anchovy salad every day, it would qualify, too. Call me a simple guy. But I digress. Freddy's is well-deserving of renewal. There is an on-going thread here. It was a popular stop on the Giro del gelato. I stopped in last Saturday and was given a sample of a new treat--fried artichoke stuffed with asiago cheese. If they were trying to buy my vote--well, too bad they didn't know I don't have one! It remains everything we want a GNR to be. Freddy's is also mentioned here and here and here. 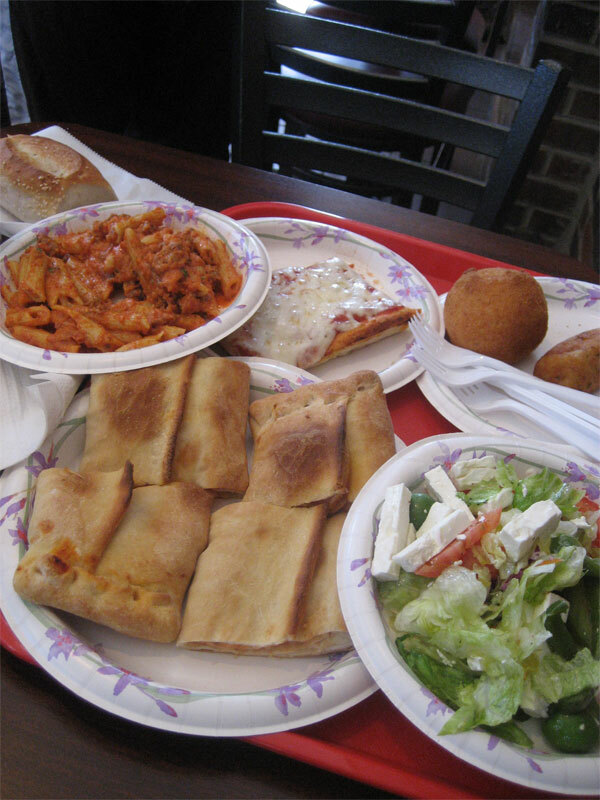 I would starve without Freddy's, my main source of bread and supplies for entertaining the Italian relatives. 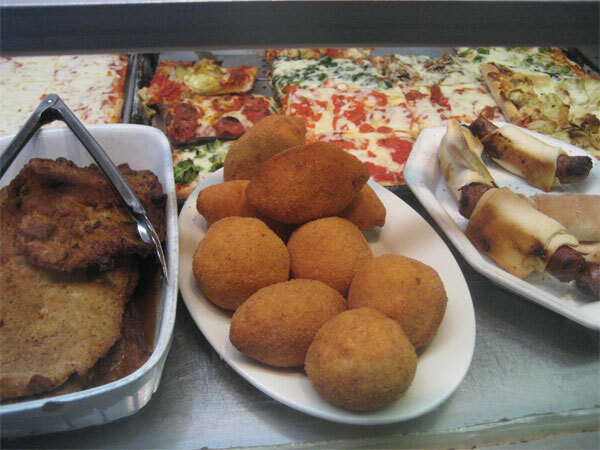 If Da Riv and Bari are archetypal GNRs, Freddy's one-ups both of them by curing a wide variety of their own meats, offering both Sicilian and Neapolitan, excellent pizzas, and savory, satisfying hot items, the penne, macaroni pies, fried artichockes, and arancini being standouts. There is something quantifiable about the salubrious effects of its Oreo gelato, like "+10 happiness for the week." It's a meta-GNR for all things southern Italian and Italian-American. Should Freddy's be renewed for a GNR. Would I think otherwise? I'm not so sure. Let me explain. Well, I'm here to argue not for GNR, but for enhanced GNR status. What I mean is that if a few years ago, Freddy's deserved to be a GNR, now it deserves to be a GNR-er. In an era where I've found so much in life to have gotten worse, I've only found that Freddy's has gotten greater. Before that argument commences, let me make the obligatory disclosures that I am a good friend of the house; they have catered significant events for me, and as some LTHers who have dined with me there know, I nearly always get some extra food provided to my table (not that I'm alone on that one). Still, as far as opinions of Freddy's goes, I am fully objective. Objective in saying that Freddy's is greater than ever. When I first endorsed Freddy's for GNR, did they make the flat sausage burgers that I get nearly every time I'm not with my wife (who has too long a list of must order items to ever make it to flat sausage). They do now. When I first endorsed Freddy's for a GNR did they make porchetta. They do now. At least often enough. And it's awesome porchetta. It is a dish, even, that deals straight on with one of Freddy's few weaknesses, the microwave. See porchetta actually heats very well in the microwave, leaving soft meat for pleasure. And what about the Margarita pizza, the one not in a pan and not in a sheet. I see no mention of it in my previous Freddy's exultatations. Why, because it's new(er at this point). All the time, there's something new or different. It's all made for a better, greater place. I can be objective and just tell you how Freddy's remains all that made it a GNR in the first place. Instead, I'd rather go out on a limb and tell you that Freddy's is even greater than it used to be. Until we set up the GNRer Board, however, I will limit myself to recommending renewal for Freddy's.